what can a pear a day do for you? The pear is one of the top 20 favorite fruits and for good reason. Not only is it delicious, but it has many nutritional benefits. 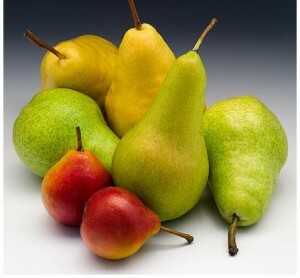 Pears contain the vitamins A, B1, B2, C, E, folic acid, niacin, potassium and iron. As an interesting note, if a pear turns brown after you cut it, this means that the iron content is high; however, if the color does not change, the iron content is low or almost non-existent. 1) A medium size pear has approximately 6 grams of fiber, which equals about 24% of your recommended daily value for fiber. The skin of the pear contains the majority of the fiber found in a pear, so enjoy the skin for added flavor, texture, and nutrients. 2) The high level of pectin in pears makes it very helpful in the lowering of cholesterol. 3) The anti-oxidant nutrients in pears are critical in building up your immune system. 4) Pear juice is a natural anti-inflammatory, relieving pain in many inflammatory conditions. 5) Pears aid in reducing fever because of their cooling effect. The best way to bring a fever down quickly is by drinking a big glass of pear juice. 6) Pears provide 30% more potassium than apples, which is necessary for maintaining heartbeat, muscle contraction, nerve transmission, as well as carbohydrate and protein metabolism. So, with all of these healthy benefits, no wonder it’s the “pear-fect” fruit! Wrinkle free cotton? Believe it or not, there is such a thing, thanks to inventor and chemist, Ruth Benerito. Ruth Rogan Benerito was born January 12, 1916 and raised in New Orleans. She completed high school at age 14 and entered Tulane University in New Orleans at age 15 to study chemistry, graduating during the Great Depression. She continued her education while working as a teacher, and took night classes to earn her master’s degree from Tulane University. During World War II she taught college classes, and earned her doctorate in physical chemistry from the University of Chicago after the war. In 1950 she married Frank Benerito, and went to work at the U.S. Department of Agriculture Southern Regional Research Center in New Orleans, where she worked for over 35 years. In 1953 Benerito found a way to chemically treat the surface of cotton that led not only to wrinkle-resistant fabric but also to stain and flame-resistant fabrics. The chemical treatment minimizes wrinkles and gives a smooth appearance to the fabric, without reducing the breathability, absorbency, and comfort of the cotton. 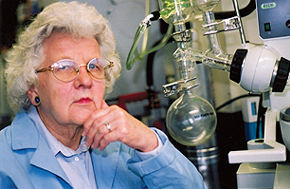 Throughout her career, Benerito was credited with 55 patents and many honors, including the Garvan Medal from the American Chemical Society in 1970 and the Lemelson-MIT Lifetime Achievement Award in 2002 at the age of 86. She was also listed in the 1992-1993 edition of American Men and Women of Science. Her husband, Frank, died in 1970. Ruth retired from the USDA in 1986 but continued to teach part time at Tulane and the University of New Orleans until 1997. She is currently retired in her home town of New Orleans. Live to laugh? Or laugh to live? 1) Laughter relaxes the whole body: A good, hearty laugh relieves physical tension and stress for up to 45 minutes after. 2) Laughter boosts the immune system: Laughter decreases the stress hormones in the body, increases immune cells, thus improving the body’s ability to fight disease. 3) Laughter triggers the release of endorphins: Endorphins are the body’s all natural “feel good” chemicals. They promote an overall sense of well-being and can even relieve pain. 4) Laughter protects the heart (yes, the heart! ): Laughing improves the function of blood vessels, increasing blood circulation through the body; therefore, helping to protect you against heart attacks or other cardiovascular issues. So, after looking at all laughter does for our physical body, what about mentally and socially? Well think about it for a second…When one is laughing, he cannot be angry, sad or anxious. Laughter relieves stress and replaces it with joy and zest. In relationships, laughter can not only strengthen them, but enhances teamwork and helps defuse conflict. Does Your Bed Measure Up? Did you know that not all mattresses are made to a standard size? Being in the bed linen business for over ten years, I have found that there is no longer a standard by which the bed manufacturers adhere to. They come close, but the measurements vary up to two inches (or more) in the width and length. For example, the standard queen has always measured in at 60 x 80, but now you will find that some queen beds measure 58 x 78. I was stunned to find this with my own Tempurpedic queen mattress. King size beds come in many different widths, ranging from 74” up to 77”, even though they claim to be a standard 76” wide. The length can vary up to two inches as well. And then there is the Eastern King, which measures 78 x 80, but does it really? If you have a twin or full size bed, don’t think you have escaped this problematic issue. The actual width and length of these beds tend to vary one or two inches as well. So if your fitted sheets never seem to fit properly, this may be the reason why. How does your bed measure up? Did you know that we come in contact with more than 500 toxins each day? With all of the environmental pollutants, preservatives in foods, and chemicals we come in contact with on a daily basis, such as detergents, shampoo, pesticides, new carpet, perfumes, hair spray (the list goes on), it’s important to rid our bodies of as much of these toxins as possible. One natural way to help reduce these harmful toxins is with a simple refreshing homemade drink…..water and lemon juice. It may sound too good and simple to be true, but lemon juice helps to aid elimination in the digestive system and flush toxins from the liver. It also aids in alkalizing the blood and body, so try to drink at least one glass of lemon water daily. Some people have also reported that with daily consumption of this lemon water concoction, they are able to lose weight easier. There are many health benefits of adding lemon to your diet, so do something healthy for yourself, and when life hands you lemons…..make lemon water! Just squeeze the pulp from ½ lemon into a glass of water, or if using bottled lemon juice mix 1-2 tsp. of lemon juice (to taste) with 10 – 12 ounces of water. It’s that simple. 1) Thread Count: Thread count is the number of threads woven horizontally and vertically into one square inch of fabric. In order to obtain high thread count fabrics, finer individual threads are plied (twisted) together to form one thread. This is called ‘plied yarn’. Threads can be either 2-ply, 3-ply or multi-ply. When a fabric is woven with plied yarn each individual ply is counted, so if there are three plies making up one single thread, it is counted as three threads, not one. With this fuzzy math method, it is easy to obtain higher thread counts, but not necessarily a higher quality. Fabric that is ‘Single Ply’ is woven with long staple cotton fibers. Longer fibers come from higher quality cotton and produce stronger, smoother fabrics. With this, a true 300tc fabric woven from a single ply cotton can feel much softer against your skin than an 800-1000 thread count woven from plied yarn. It is possible to obtain a true 500 to 600 thread count fabric with these finer single ply threads. Egyptian Cotton: Grown only in Egypt, Egyptian cotton is a long staple cotton that has a reputation of being one of the highest quality cotton available. Pima Cotton: Ranked right behind Egyptian cotton, Pima cotton is also a long staple cotton with the same superior quality, however, it is grown in the Southwestern United States. Combed Cotton: Cotton that has undergone a process called ‘combing’, which removes the short fibers and any remaining debris with the cotton. Combed cotton is stronger and finer, and produces a higher quality cotton fabric. Organic Cotton: Cotton grown in conditions free of pesticides or herbicides. Organic cotton will have a government approved certification on the packaging. 3) Types of Weave: Although there are different types of weaves, bed sheets usually do not state what type of weave the fabric is unless it is a ‘Sateen Weave’. Sateen is a type of weave that places most threads on the surface (four over and one under compared to one over and one under with a standard weave). A sateen weave creates a luxuriously soft silky feel. With all of this said, you may still be wondering what type of sheets are right for you. Before you buy, try to obtain all the information you can about the fabric you’re considering. The two most important things to keep in mind is: What kind of cotton is it made from? What ply is it…multi-ply or single ply? The bottom line is you spend one third of your life in bed, so treat yourself to the most comfortable and best quality sheets you can afford.